For background, see my previous reports on recent work at the site in June and August 2011. The impressive clean-up effort, which went down and exposed the floor of the pool, was supposed to be coupled with a drainage project to prevent the place from returning to its former state as an eyesore and health hazard. 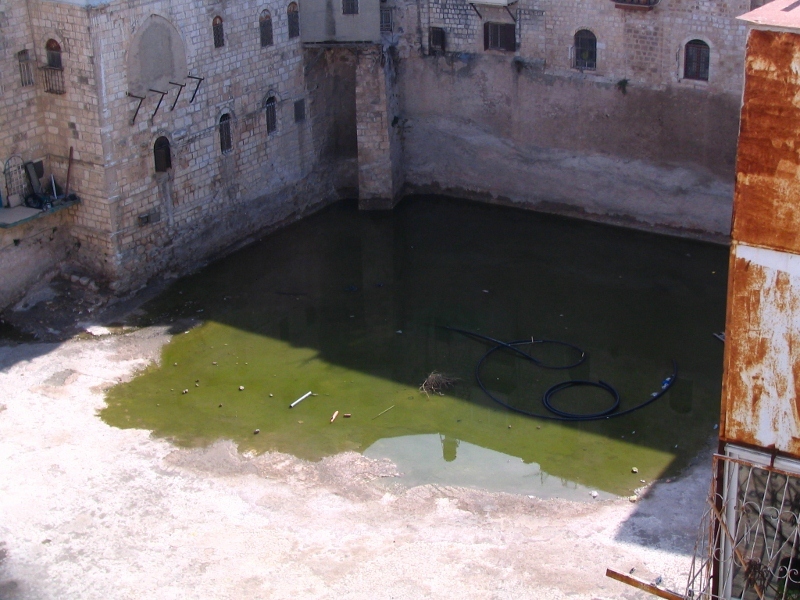 In November, after our first respectable rain in Jerusalem, I got curious and went to have a look: The photo below shows the southern end of the pool once again filling with rainwater, A corrugated plastic conduit was in evidence; I presume its intended function was for pumping water out, but it looked as if it had come loose from its moorings and floated free. Anyway, it was not getting the job done. Southern end of Hezekiah’s Pool, Nov. 2011, looking southeast. One by-product of the rain, however, was to further clear the floor of dust, providing a better look at the surface. 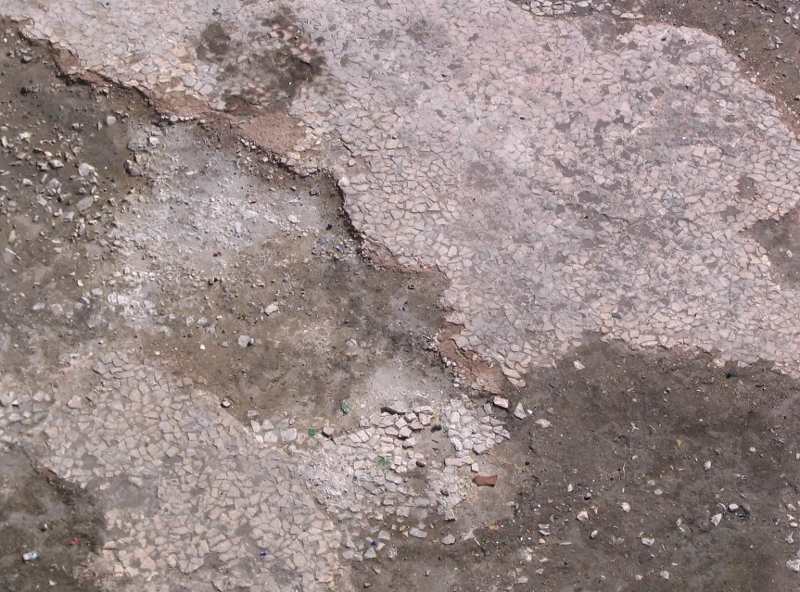 The photo below shows a section of the pool’s floor near the western edge. It’s clearly a pavement of small, flat stones set in a matrix of reddish looking plaster. Any guesses as to the age of this floor? Does anyone know, from written sources, when the pool was last used as a public water source? On January 1st I was back for a look (but without my camera). This was after our second serious rainfall of the season, over Christmas weekend, and the pool was a bit fuller. On this occasion I observed a lone workman in waders mucking about (literally) in the stagnant water in the southern end. I don’t know what his specific objective was, but, again, if they intend to pump the pool, they ought to get on with it! Hezekiah’s Pool, looking SE. MARCH 2012. UPDATE: By March 2012 (above photo), the lake had grown considerably. I checked in June and it was dry. 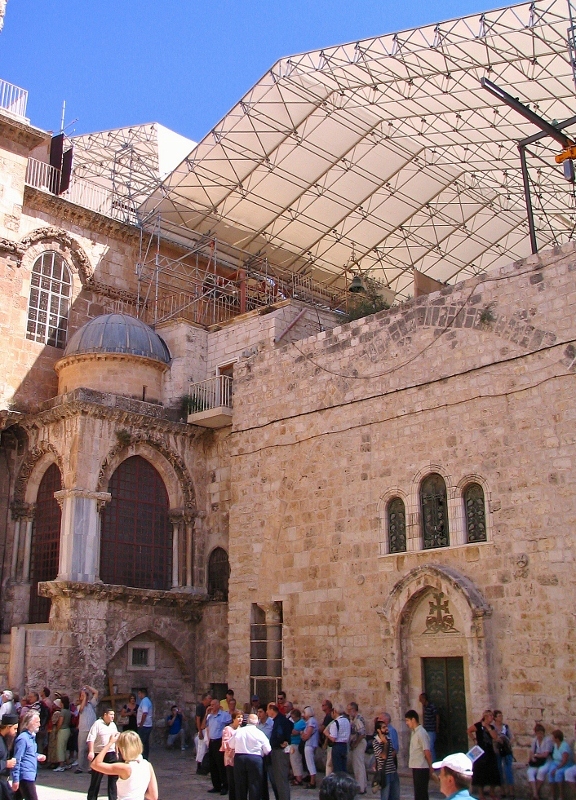 Visitors to the Old City these days may notice two large, white, tent-like canopy structures covering the buildings on the east side of the entrance courtyard (parvis), and over the adjacent roof areas to the north. This is not exactly news, since I first noticed this installation last Easter! At first I thought this covering must be connected to this story from three years ago about the precarious condition of the Ethiopian monastery on the church’s roof and of all its associated chapels. (I subsequently learned, from someone who would know, that story was greatly overblown — much ado about nothing: the issue seems to have been the state of the monk’s rather primitive plastered huts which, needless to say, are not “up to code”.) That’s not what th e canopy is about, though. The chapel is dedicated to, yes, that Abraham, the progenitor and patriarch of the Book of Genesis. 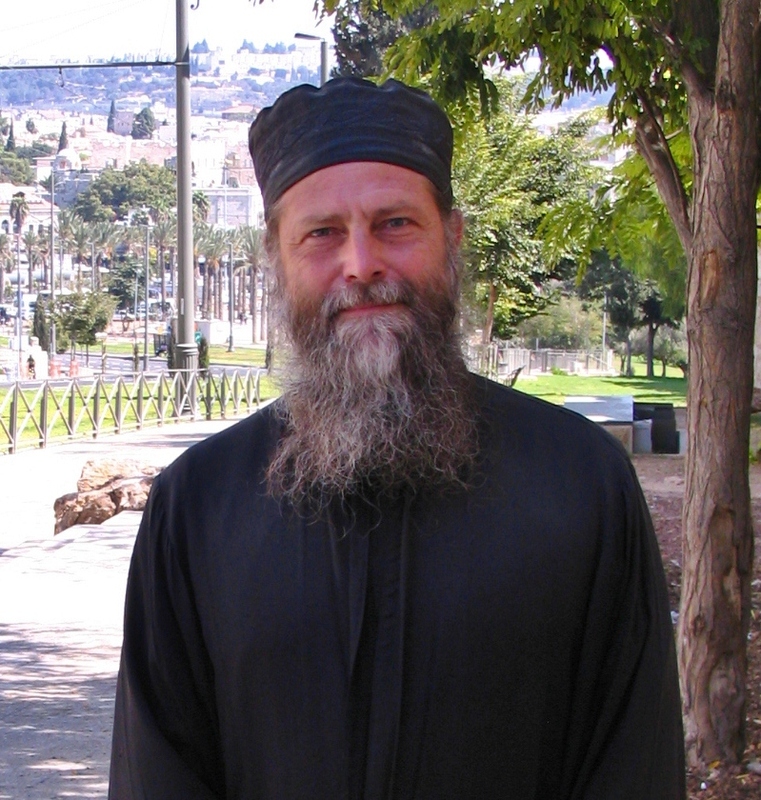 Father Alexander says it has only one fixed, liturgical function: it is the site of a special mass for the Feast of the Twelve Apostles, to whom one of the altars inside would be dedicated; the annual feast falls in June/July. 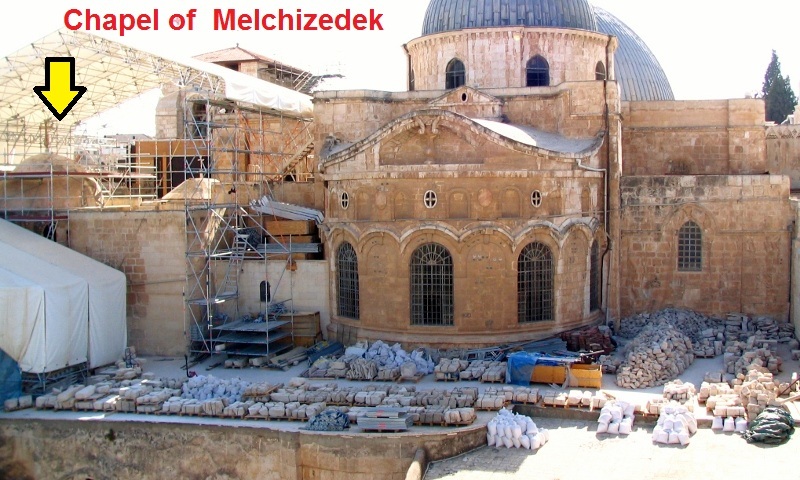 Jerusalem being Jerusalem, it should not be surprising that nearby is yet another chapel, this one dedicated to Melchizedek, the “king of Salem” and “priest of God Most High” whom Abraham encounters and receives a blessing from in Gen. 14. 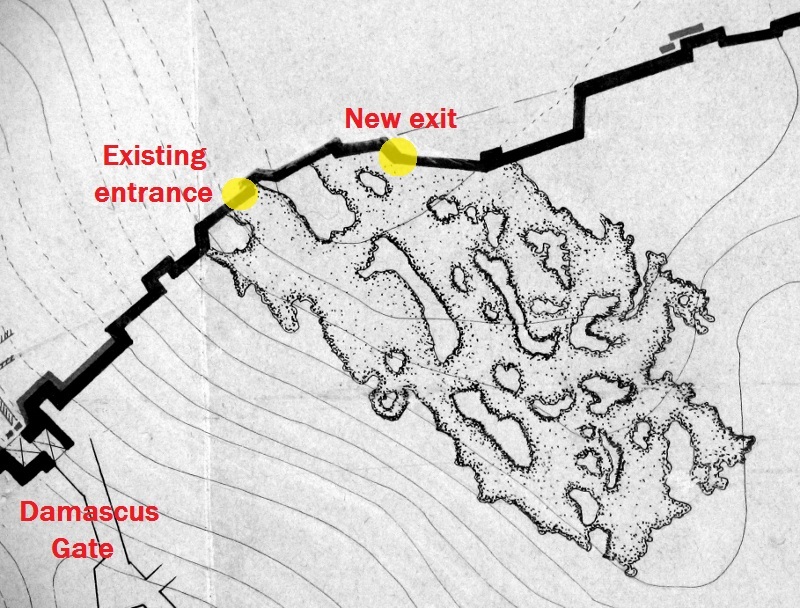 There, in an angle of the city wall (and the underlying rock scarp), a pre-existing opening (marked by a now-defunct metal frame) was being extended downward. Moreover, markings spray-painted on the scarp suggested that a sizeable cut was to be made in the bedrock, to further enlarge this passage. I realized that all this must connect with one of the eastern rooms of the Solomon’s Quarries complex, as indeed it does. This was confirmed by the attendant at the SQ entrance kiosk, who said an “emergency exit” was being constructed. This map was created by Fr. Vincent of the Ecole Biblique in the early 20th century. Markup shows the present entrance and the area of the new work. 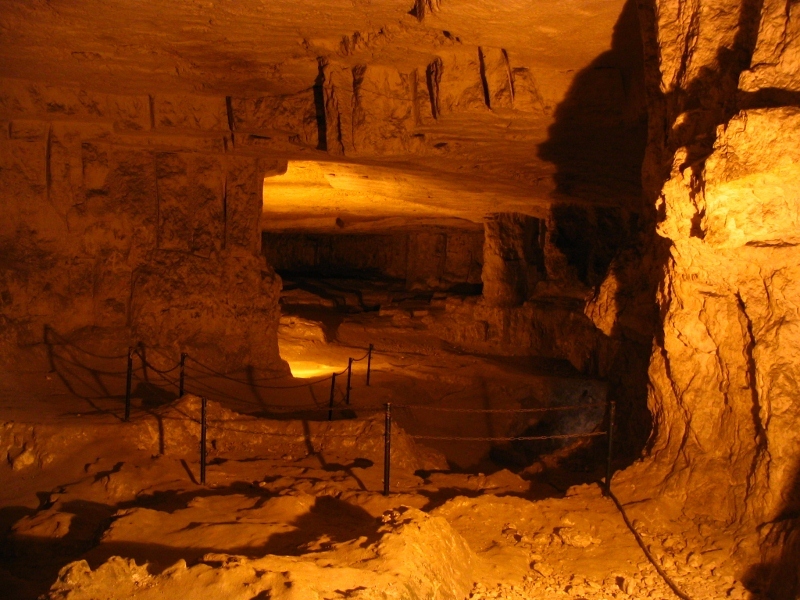 For those who may not be familiar with this place, Solomon’s Quarries, aka Zedekiah’s Cave, is an impresive series of interconnected galleries cut out of the bedrock and stretching over 650 feet beneath the Old City. Both of the common names are traditional: “Zedekiah’s Cave”, the name used by Jews, reflects an old legend — but seen already in the Talmud — about the escape of the last king of Judah from Jerusalem, fleeing the Babylonians. “Solomon’s Quarries” is a bit more accurate — they are in fact quarries, but mostly, or perhaps entirely, from the Roman period. Rediscovered in modern times by James Barclay in the 1850s, the Quarries have been repeatedly opened to visitors and then closed again over the years. Since about 2007 they have been consistently open, under the management of the East Jerusalem Development Corp., a joint, government-owned entity of the Jerusalem municipality and the State of Israel. Facade of Solomon’s Quarries. At right, the modern entrance. Red line: the original, ancient opening. The deed is done: The bedrock has been cut away to enlarge the opening and a tunnel of heavy steel I-beams starts to take shape. 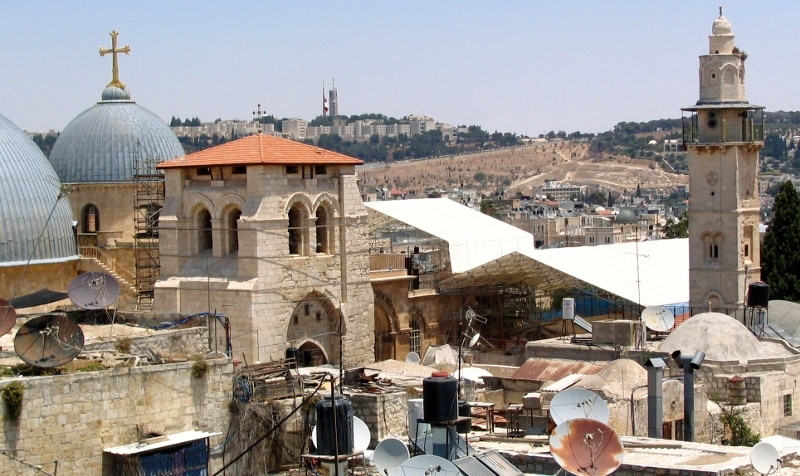 MARCH 2012.
one of the main sites in the old city that the authorities have targeted for development. … The Antiquities Authority has recently approved the excavation of an artificial entrance to serve as an emergency exit – a requirement for turning the cave into a banquet hall. The Jerusalem Development Authority is investing an enormous effort to promote tourism in the northern part of the Old City, and Zedekiah’s cave is a central site for realizing that goal. The cave is located at a spot that is rarely visited by Israelis, but which is known as a business and residential center for the city’s Palestinian residents. The best way to preserve the cave and the local fabric of life would be to avoid holding events at the site and definitely to refrain from carving new entrances. But the Antiquities Authority has not opposed the new use and has even backed the project. 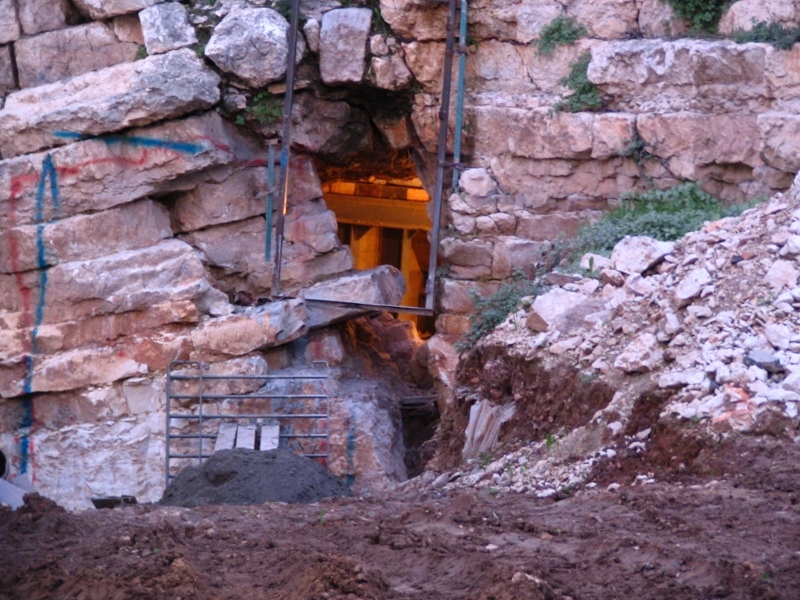 Zedekiah’s Cave, like other archeological sites in Silwan and the Old City, is viewed as an asset for reinforcing Israeli control of Jerusalem at the expense of the needs of the residents, while also damaging archeological treasures. Another recommended resource: It’s encouraging that other folks are constantly monitoring some of these issues. 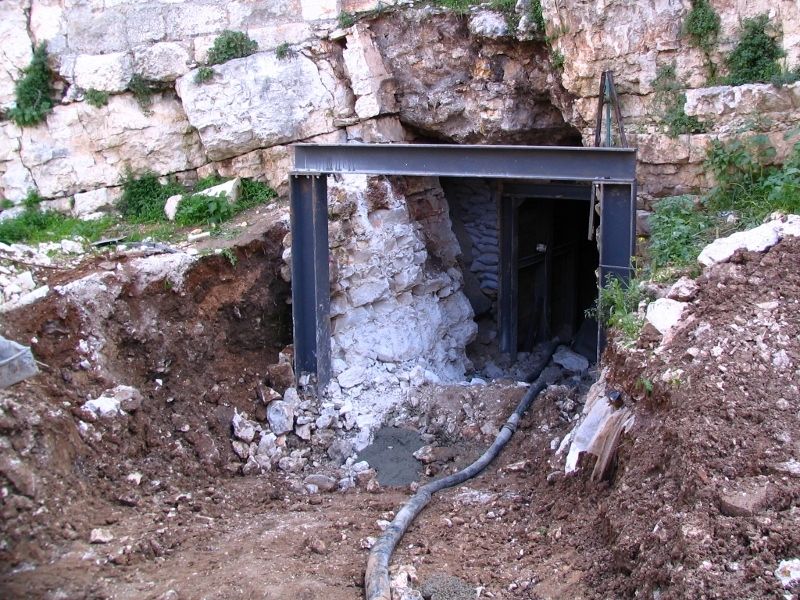 The people at Emek Shaveh are always issuing reports and e-books on the problematic excavation and development sites in and around the Old City. The following picture was taken just outside the entrance to Solomon’s Quarries. The question is: What (in Jerusalem’s ancient architectural history) does this remind you of? PICTURE QUIZ: What does it remind you of? This entry was posted in Church of the Holy Sepulchre, Hezekiah's Pool, Israel-Palestine Scene, Jerusalem Antiquities and tagged Chapel of St. Abraham, Church of the Holy Sepulchre, Hezekiah's Pool, Jerusalem, Old City, Pool of the Patriarch's Bath, Solomon's Quarries, Zedekiah's Cave. Bookmark the permalink. 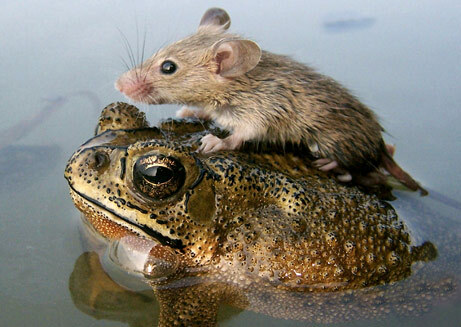 Absolutely fascinating! Great Stuff, Tom! Thank you for posting all these items. 2) the one of those same stones that fell into the drainage canal discovered by Warren and recently opened to tourists. Fantastic article all around, Tom! Joe, hi! YES, that’s exactly what I had in mind! Obviously, you’ve been doing your homework! 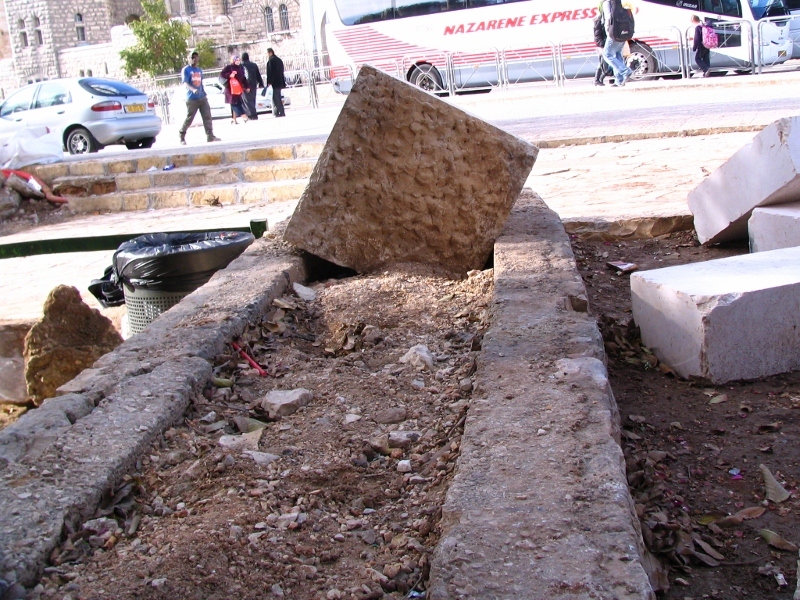 About the original stones (there are two like this, wedged in the drain channel): What I did not realize myself until recently is that they came down NOT in the DEstruction of the Temple Mount in 70 AD, but in its CONstruction — specifically the building of Robinson’s Arch, which was directly overhead. They in fact are special, wedge-shaped stones called in architecture “voissoirs”. The scenario: The arch and drain were both under construction at the same time; the stones slipped out of place or otherwise got loose (expletive deleted! 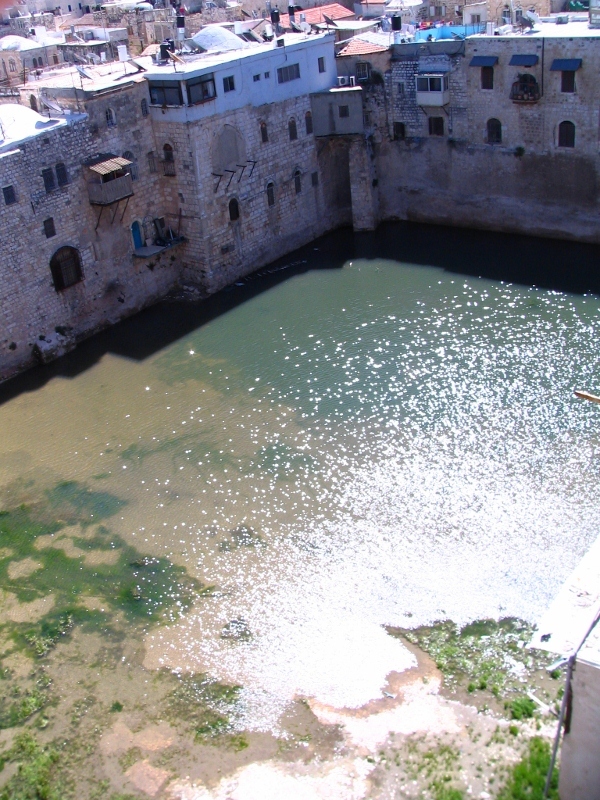 ), fell, and wedged in the still-open, rock-hewn bottom part of the channel; they were then incorporated INTO the vaulting OVER the channel, and that construction was finally covered with a couple of meters of earthen fill and wound up beneath the Herodian street, out of sight. 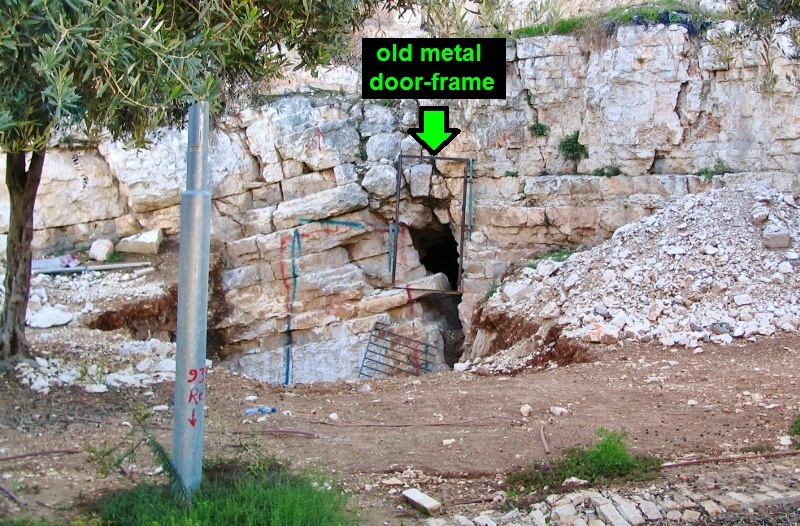 In short: evidence of a construction accident 2,000 years ago! That’s what the archaeologists have pieced together. OK, I want to hear about this. 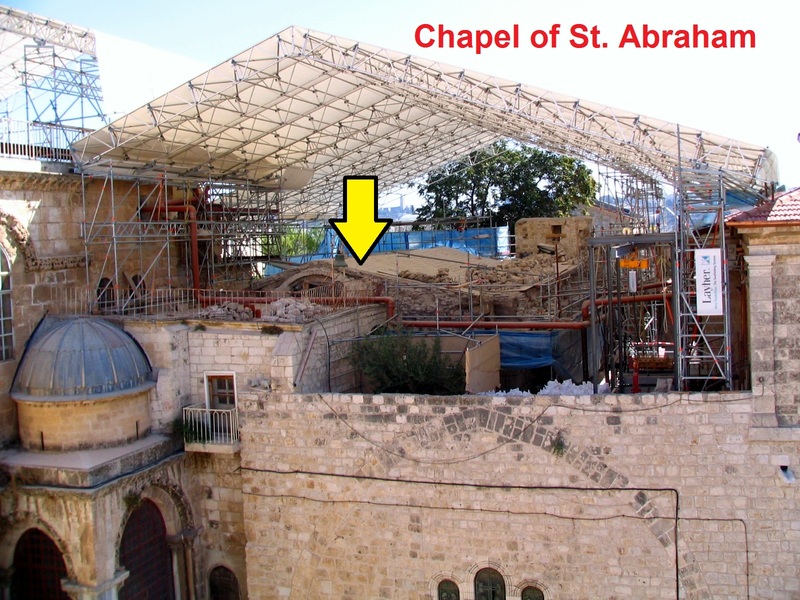 Actually, the “Chapel of Abraham” ist the only Chapel within the Holy Sepulchre compound that might rightfully be used for purposes of worship by protestants, i.e. anglicans. The right to do so was granted to the Anglican church in 1885, and the chapel is still being used by them from time to time.